Some people visit museums, go shopping or sightsee while on vacation, but not me. On my agenda visiting Scottsdale was hockey. This year I went to visit family, who are also Detroit Red Wing fans, in the desert. Monday morning my “sister” Sheila called the Phoenix Coyotes’ about times for the morning skate. Tuesday was the day. We got a slow start and when we got there the players were already off the ice. Next plan was to wait with the fans for autographs and pictures, all two of them. I had a great time talking with hockey mom Christine and her son Chris who are in the photo with Robert Lang. 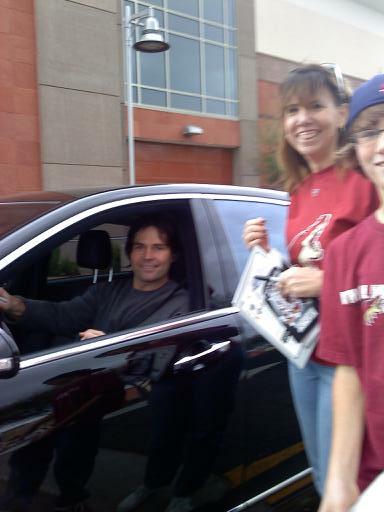 Christine is in a fan group Hockey Moms for Shane Doan, and Chris is a big Illya Brzgalov fan. The Coyotes were very friendly and happy to stop for Christine, who was flagging the players down as they drove out into the parking lot. A dust storm was brewing and the skies were beginning to show signs of rain, but I stuck it out to see one of my favorites players, Petr Prucha. Yes, been a fan since the early New York Rangers days when Prucha was a hopeful to side with Jaromir Jagr and bring the cup to NYC. I’m not giving the rock and roll sign in the photo, rather trying to keep my hair out of his face and mine for a good shot. Peter Mueller was priceless. I approached him in a black min-dress, cowboy boots and my card. I introduced myself as an NHL writer. I write about the NHL. Peter looked at me with a funny look, “you’re an NHL writer?” I assured him I was. “You’re an NHL writer,” he said again but with more emphasis in making sure he heard me right and that he wasn’t a victim of a prank. 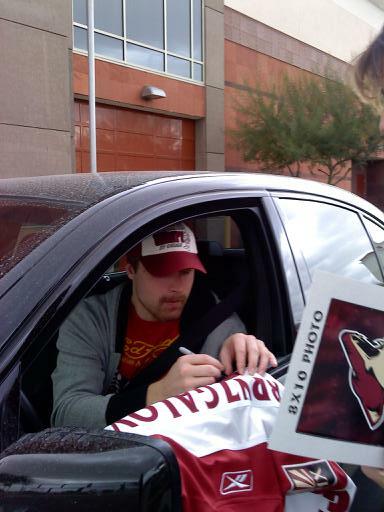 Captain Shane Doan came out last, as usual according to Christine, and stopped to sign our program. 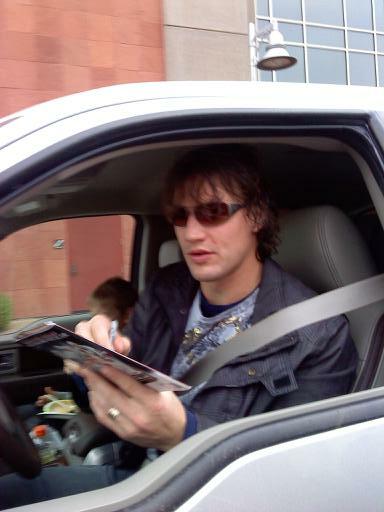 Doan was very happy to talk and appreciated the fans. My Christmas was a Coyote howling great experience. Thanks Christine and Chris for being such great fans to hang out with. Thanks Sheila for supporting my hockey habit. You can also find Ryan on Facebook- become a fan!